The pocket friendly LG G Flex 2 has a 5.5 inch full HD curved P-OLED capacitive touchscreen with a pixel resolution of 1080 x 1920, giving a pixel density of 403ppi. Protected by Corning Gorilla Glass 3, the device has a 700mm radius curve with the rear being slightly steeper with a 650mm radius curve allowing for better grip. 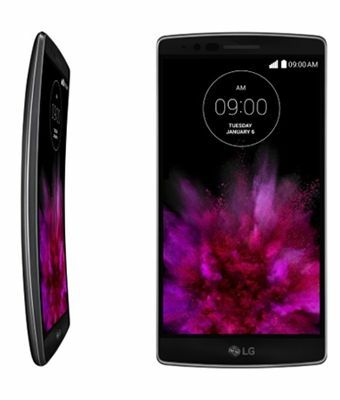 LG's G Flex 2 has a 13 megapixel rear camera with optical image stabilisation, dual LED flash and fast laser autofocus. It has a resolution of 4128 x 3096 pixels. The 2.1 secondary front facing camera is also capable of shooting 1080p video at 30fps. With Gesture Controls the device is very selfie friendy. Simply hold up the phone, take the selfie and close your fist. This then starts a timer which automatically provides a preview and then reverts to camera mode if your raise the device again for another shot. The LG G Flex 2 measures 149.1 x 75.3 x 7.1-9.4 mm and weighs 5.36 ounces. The device has a curved body and display and arrives with a self-healing polymeric back panel coating, which heals in 10 seconds. The body is also flexible and shock resistant and due to the curved back allows superior audio experience. The device is available in two colours, Flamenco Red and Platinum Silver. The LG G Flex 2 software is Android 5.0 Lollipop with a Qualcomm Snapdragon 810 chipset. The device has Bluetooth v4.1, NFC, Wi-Fi 802.11, GPS and GLONASS. The Flex 2 has 2 or 3 GB of RAM, depending on whether you opt for the 16 or 32GB version. The G Flex 2 has a non-removable 3000mAh battery which allows fast charging, up to 50% capacity in under 40 minutes.